The Great Beach Drive takes you across 380 kilometres of the most pristine, and deserted, beaches in Australia. Craig Tansley discovers a different side to Noosa on one of the longest beach drives on Earth. While many visitors to Noosa stick to its main street or beach, the resort town is built on the edge of a 4000-hectare national park and it doesn’t take long to escape from civilisation. Twenty minutes north of town, a car ferry takes you into the wilderness, where the bitumen stops, and the sand starts. Queensland’s Great Beach Drive is one of the longest beach drives on Earth. Where it differs from other iconic ocean drives is that this one requires you travel almost entirely on the beach – from Noosa, right along Fraser Island, and beyond to Hervey Bay and Tin Can Bay. It takes in two UNESCO biosphere reserves (this is the only place on Earth where two biospheres connect) and the largest sand island in the world. Before I start the Great Drive, I’m told the Sunshine Coast’s biggest secret is just 20 minutes’ drive west. There are only two everglade environments on Earth and one of them is right here at Noosa (the other is the Everglades National Park in Florida). A half-day kayaking (www.kanukapersaustralia.com) expedition (with an Australian kayaking champion) puts you in the company of half of Australia’s bird species and almost 1500 plant species. I don’t see another human for four hours, there are 150,000 hectares of solitude within this biosphere. I’ve traversed Noosa River by ferry. But before I find the beach, I’m swapping my ride. Award-winning Equathon Horse Riding Tours (www.equathon.com) operate on the beach here and afford the chance to ride with three-time Olympian, Alex Watson. Don’t go expecting tar roads on the Great Beach Drive. We drive through coastal forest till we reach a wide, deserted beach. Welcome to the highway. The speed limit is 80 kilometre per hour (though you try finding any lanes). We keep a watch out for fishermen casting fishing lines by the shore’s edge, and a handful of campers crossing the sand highway for a dip – you can camp all along these foreshores. We reach a rocky headland that Captain Cook named Double Island Point, and this is where you’ll often find Thor. Locals tell me that Chris Hemsworth has a holiday house just north of here at Rainbow Beach (of course he does). Thor knows his waves: Double Island Point is one of Australia’s best point surf breaks. There’s a 150-year-old lighthouse up here and not much else. You can see forever – come whale season humpbacks travel just off the cape. There’s a dive site just off-shore that’s home to Queensland’s largest colony of (harmless) grey nurse sharks. Angelina Jolie dived here last year, and borrowed Rusty Crowe’s helicopter to get here (of course she did). Drive to the northern side of the point and you’ll find one of the country’s top beaches, Honeymoon Beach. We pass thousands of blue soldier crabs beside a beach lagoon. Two old surfers ride waves that break slowly for hundreds of metres. For those of us who ever fancied a beach to ourselves: we’ve died, and gone right to heaven. The coloured sand dunes that continue north from here are world famous, but who knew it? There are 72 colours visible in these enormous dunes. Thor’s house was built here in Rainbow Beach, a sleepy coastal hamlet cut off from Queensland’s main highway. It’s a great hideaway for a Hollywood star, because it works… I can’t find him. Just north of town, we drive onto a sandy headland to find a barge waiting (this is Inskip Point, the southern gateway to Fraser Island). Fraser Island is a 4WD enthusiast’s fantasy: there are 123 kilometres of coastline to drive along, though we’re never on it long – there are a lot of things to look out for if you detour off into sand tracks through coastal forest. Everyone knows Lake Mackenzie. It’s the electric blue of a Bora Bora lagoon (minus the over-water bungalows). Though I find I prefer the solitude of nearby deserted Wabby Creek, surrounded as it is by 70-metre-high sand dunes. 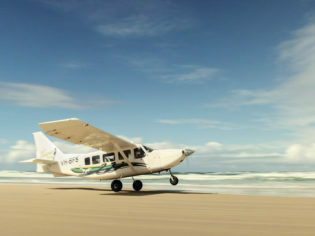 Not only is the beach on Fraser Island a highway, it triples as a runway (www.airfraser.com.au). 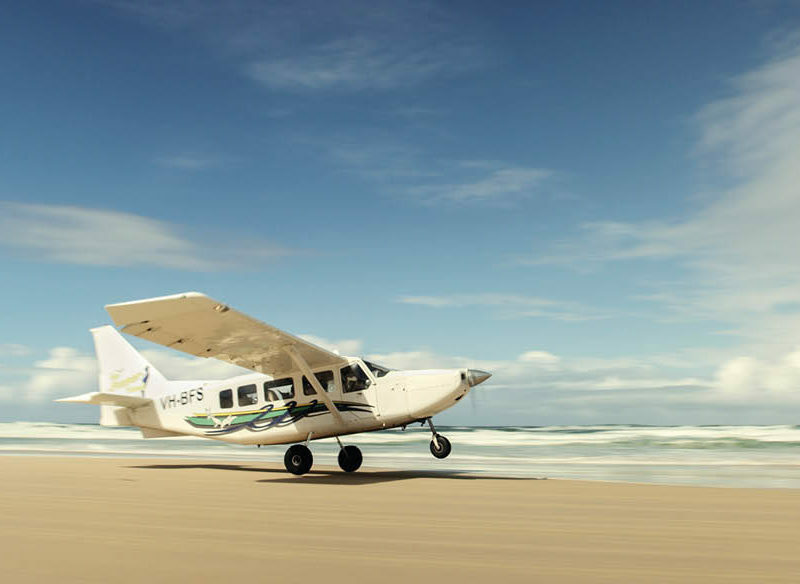 We go for a spin, taking off at mid-tide with waves rolling onto the wheels, and look down on ancient rainforest growing right out of sand, and over 100 freshwater lakes sprinkled across forest. You needn’t rough it on the Great Beach Drive – my accommodation at Rainbow Beach was five-star with views across the ocean (www.plantationresortatrainbow.com.au), and four-star Kingfisher Bay (www.kingfisherbay.com) on Fraser Island’s west coast looks across an inland waterway. Though you could camp instead – practically everywhere on the Great Beach Drive is a campsite. I take a car ferry across to the town of Hervey Bay and drive the empty roads between there and the quirky outpost of Tin Can Bay. Here we drive beside the Great Sandy Strait, inside the UNESCO-listed Great Sandy Biosphere. But who’s heard of it? There are sheltered bays and white sandy beaches all along the way. It’s also one of Australia’s most diverse ecosystems: there’s more marine and fish biodiversity here than the entire Great Barrier Reef, with over 7000 species of flora and fauna. There are turtles and dolphins in the Sandy Strait beside the road – and if you’re lucky, you might see a dugong too. I didn’t. I didn’t see Chris Hemsworth in there either. Take the Great Beach Drive with Great Beach Drive 4WD Tours, www.greatbeachdrive4wdtours.com; see Fraser Island with Fraser Experience Tours, www.fraserexperience.com; and learn to surf at Rainbow Beach wwwrainbowbeachsurf.com.au. Is Noosa the relaxation capital?